Brandon Boynton, a junior majoring in applied computer science in the IUPUI Honors College, is CEO of Vemity. The high-tech business-to-business start-up offers artificial intelligence-as-a-service. In late 2018, he reached out to 66 junior and senior computer science majors at IU, IUPUI and Purdue. A few of his observations on what he learned and how it might affect whether a student/future worker would locate in Indiana compared to San Francisco. Ratio of salary to cost of living: When it comes to cost-of-living ratio, it’s pretty difficult to beat Indiana. The average base salary for a software engineer in Indianapolis is $115,000, compared to $137,000 in San Francisco. However, the cost of living in Indianapolis falls at just 91% of the national average, while San Francisco’s cost of living is 128% of the average. In other words, the relative salaries, or purchasing power by location, comes out to be $126,000 in Indy and $107,000 in San Francisco. It’s fair to say that Indianapolis takes the win on cost-of-living ratio. Office space and culture: Silicon Valley is widely known to be the leader of innovation-inducing company culture and office comfort. Companies like Google are famous for their employee office benefits. But the rest of the country has picked up on the fact that employees do in fact enjoy comfort. Working at Vemity, I have had an opportunity to visit dozens of tech companies in Indianapolis and have yet to see a stereotypical “corporate” office. Most of the offices I visit boast hammocks, standing desks, snack supplies and much more. Chance to climb the ladder: It’s clear to see that college graduates entering the workforce are eager to make a name for themselves and want to work for a company where vertical movement is possible. Considering our two examples, let’s break down the potential opportunities for employees. In San Francisco, we see many, many small start-ups working to disrupt a market, typically with a unique technology. Beyond that, we see many very large corporations, but not a lot of companies in the middle. 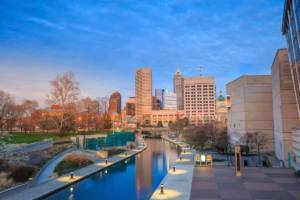 In Indy, we see a number of start-ups, many medium-sized scale-up companies, and a handful of notably large companies like Salesforce and Genesys. In the start-up world, being an early hire is a risky endeavor. In the event that the company takes off, the employee not only has a better chance of maintaining a high-level position, but employee options can yield great returns. But very, very few start-ups reach a successful exit. Comparatively, medium-sized tech companies, as are prevalent in Indy, offer a greater potential than in “mega-corps” to move upward if the employee proves their worth. Without as much competition in the workplace, a lesser employee can gain a managerial or executive position even if they wouldn’t be hired into an entry-level position at a company like Google. Finally, with mega-companies like Google, Facebook, Apple and Amazon, the potential for upward mobility exists, but certainly not to the extent that it does in other companies. Many say that moving up the ladder is nearly impossible. The results certainly surprised me. The options were simple: the student’s current locale, to the state, to the region, to the rest of the world. With “Elsewhere” as an option, it would be reasonable to predict it as the overwhelming winner. However, the smallest region came in neck-and-neck with the largest. As I see it, there are two primary reasons why Indiana maintained about 50% of the students. Perhaps students who establish their life and career while at a university become loyal and attached to the state — maybe so much so that they disregard any previous or current desire to relocate. Alternatively, maybe Indiana and the Midwest truly are competing with the traditional “tech hubs” as far as employment attraction is concerned.